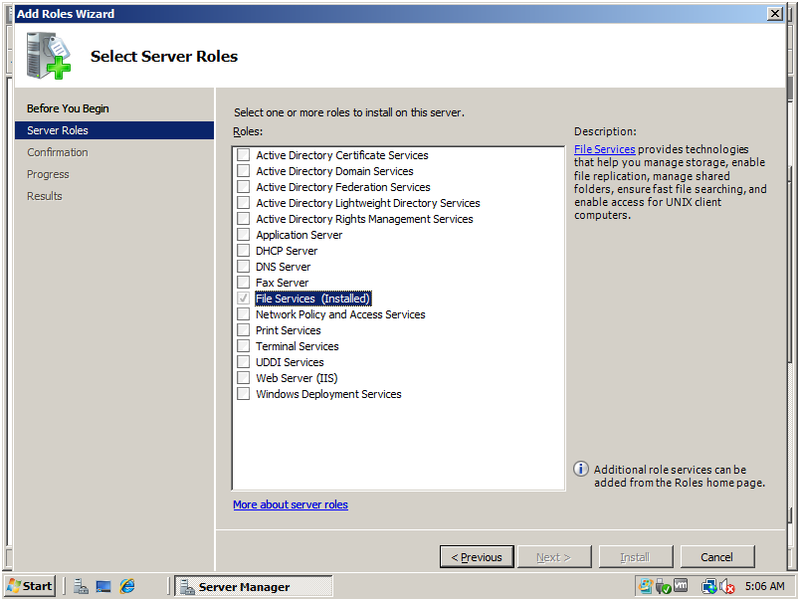 1.Log on to the Windows Server 2008 R2 system with an account with administrator privileges. 2.Click Start, click All Programs, click Administrative Tools, and select Server Manager. 3.Click on the Features node in the tree pane, and then click on Add Features in the tasks pane. 4.The Add Features Wizard opens. On the Select Feature page, click the plus symbol next to Remote Server Administration Tools. 5.Click the plus symbol next to Role Administration Tools. 6.Click the plus symbol next to File Services tools, check the File Server Resource Manager Tools check box, as shown in Figure 1, and click Next to continue. 7.On the Confirm Installation Selections page, review the selections made and click Install to continue. 8.On the Installation Results page, review the result summary, and click Close to complete the installation. 5.Double-click on Share and Storage Management. 6.Double-click on the File Server Resource Manager console. 1.Double-click the Quota Management node under the FSRM console. 2.Select the Quotas node in the tree pane. 3.In the Actions pane, click the Create Quota link to begin the process. 4.When the Create Quota window opens, specify the path for the quota, such as E:\UserShares. 5.Select the Auto Apply Template and Create Quotas on Existing and New Subfolders option button. 6.In the Quota Properties section of the window, select the Derive Properties from This Quota Template option button and from the drop-down menu, select the 200 MB Limit Reports to User template, and click Create, as shown in Figure 2. 7.After the quota is created, click the Refresh link in the Actions pane. 8.In the tasks pane, the new quota will be listed, along with the quotas applied to all existing subfolders and the current status of each quota. 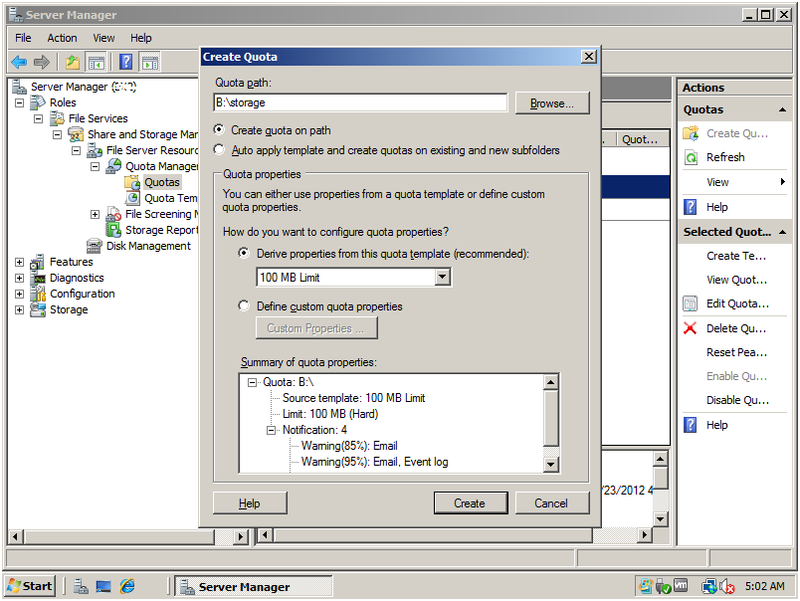 9.Review the quotas as desired and close the Server Manager console.